The Residents of Laindon and Langdon Hills, Essex. Tender to Your Majesty their Loyal and Affectionate Greetings on the occasion of your Coronation. I have to admit I remember very little of the Queen’s Coronation other than I watched it on a small black and white television in the front room of our house in Pound Lane. I believe it was a Bush television with a magnifying glass cover attached to the front of it. I vaguely being given a Coronation book from school but that has long disappeared. 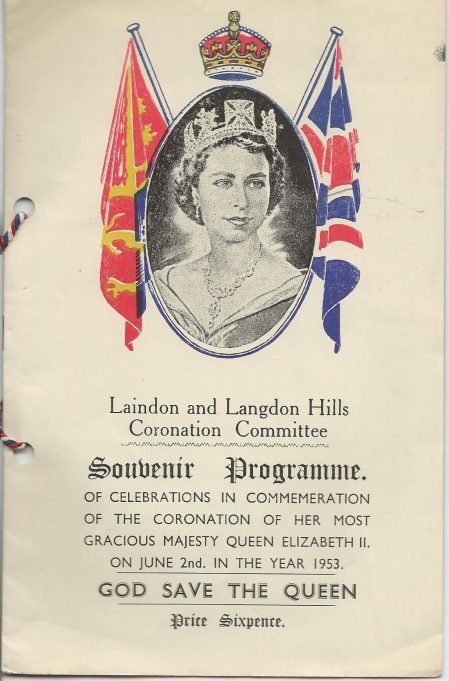 What has prompted me to think of the Coronation is not the wedding of Prince William to Kate Middleton or the Queens Diamond Jubilee in 2012 but a Laindon and Langdon Hills Souvenir Programme I have just been given. I had never appreciated that a local committee had organised a week long of celebrations commencing on the day she was crowned, 2nd June 1953. The Residents of Laindon and Langdon Hills, Essex . Tender to Your Majesty their Loyal and Affectionate Greetings on the occasion of your Coronation. The week’s celebration commenced on the 2nd June with Special Intercession Services for the Queen at the parish churches of St Nicholas and St Marys at 8am. Then in the evening 8pm to 12pm at Westley Heights there was a Torchlight Procession, Square Dancing, Demonstration Team with Rhythm Rangers with the Beacon being lit. The Hill Billy Band led Community singing and a rocket signal was fired at around 10pm. The Crown Hotel got in on the act with refreshments at popular prices. On the Thursday 4th June at 8pm, the St John Glee Party presented the ‘Grand Variety Show’. On the Friday 5th June at 8pm it was the turn of the Revellers Concert Party and they presented ‘A Grand Revue’. Then on the Saturday 6th June, festivities started at 3pm and went onto 11.45pm. The opening was a Grand Garden Fete at the Laindon Hotel Meadow. Then at 7.30pm to 10pm there was a Grand Floor Show and Cabaret by the: St John Glee Party, New Repertory Co, The Revellers Concert Party, Laindon Players, Laindon and District Operatic Society Community Singing with Square Dancing to the Hill Billy Band – “Let the People Sing”. On Sunday 7th June there was a procession of uniformed and other interested organisations led by Warrant Officer Carnall from Laindon High Road School led by the Rayleigh Town Silver Band. The procession congregated at the Laindon Hotel Meadow for a Drumhead Service of Thanksgiving (Inter-denominational). Finally on Wednsday 10th June there was a special children’s day with a pageant by the children of Laindon and Langdon Hills schools. Best Garden and Best decorated shop. What a week it must have been and it just shows the community spirit that Laindon and District had 60 years ago. If you have any memories or photographs of this celebrations please get in touch or comment on the web site. Hi, I live in the USA but was born in Laindon (Kings Road) in 1949 and lived there until I was 18. My recollection of the Coronation was a party for kids at the Dartboard factory, which was on the Arterial opposite the end of Kings Road. I was 2 years old and won the best fancy dress prize as a ‘doll in a box’! I remember that the outfit (a green and silver confection made by my mum) was itchy and the frame of the box (made by my dad and decorated w/ red, white and blue stripes) hit my shins when I walked and caused me a lot of grief! My prize was – a doll in a box! I remember the whole class walking from Langdon Hills CP down to the cinema to watch the coronation on film. I remember our whole class being walked down to the cinema to watch the film of the coronation. We also were given a commemorative book and mug. Both long gone. I think mum gave them away! We also watched the coronation on a small Baird TV with a huge magnifying glass that hung over the screen. Not many people had televisions in those days. Bill, is this the same Carnall family that that I knew? There was a Pauline Carnall who was in my class at Langdon Hills and LHR. There was also a Harold Carnall, a couple of years older than I, who lived in Vowler Road. Hallo Alan, I cannot say for certain if that it was the same family which lived in Langdon Hills but quite certainly it was a Harry Carnall who played for Laindon CC. He worked at Rotary Hoes and at the time when we played at the Essex Country Club he would often manage to obtain the loan of a rotary hoe with grass cutting attachment to enable pitch preparation. He married a girl from Church Rd. whose name I cannot remember, but lived in a thatched cottage which was later demolished and the house built on the site is where Perry McCarthy lived in his teenage days. I think the children’s pageant which took place on Wednesday 10th June as mentioned above, may have been the one I remember. It took place on the field of Laindon High Road School. I was nearly 7 years old and was taken along by my older brother and his wife to watch our 14 year old sister sister Anne in the choir. The choir performed on a temporary stage that had been constructed on the field, with a curtain that could be drawn around it. They began by singing ‘Greensleeves’. There was an afternoon and an evening performance. Three horses were used for Queen Elizabeth I and her attendants to ride onto the field. Anne’s friend Sylvia Short and June Hogan were both chosen to play Queen Elizabeth I because they had lovely red hair. Sylvia Short was in the performance that I attended. I remember the big white ruff she wore around her neck. Perhaps other people will also remember the event and may even have a photo of two! While this page has been recorded in the archive for over two years, I have never before read it. It does however stir my memory as it mentions a Warrant Officer Carnall leading a parade. His rank I believe was not that of the serving forces but in connection with the Air Training Corps and was invaluable by keeping some of our youth “off the streets” and by instilling some discipline and a sense of social responsibility. People who devote their time to such causes are rarely given the credit they deserve for their contribution to our societies. PS. Mr. Carnall also had sons who played for Laindon CC. Hello Isabell, remember you now yes I also think I have that little book somewere and the mug we were given still sits on my dresser. I find it so nice reading the messages on this site and all the memories they recall. I have lived in Suffolk since 1970 so lost touch with Laindon a long time ago. So its good recalling all the names of the people we grew up with how the years have flown. Jean, I remember us being given a book on the history, which I still have somewhere, also a coronation mug, which I also still have. Not much else except watching the Coronation on a local TV near us. Will try and contact you via facebook, didn’t know your name was “Rowe”. Jean, on the first picture I am in long dress on left, the girl next to me is called Megan. On the second picture I am second in on the right and I think the gril next to me is Megan. More pictures should appear on this site soon. Jean and Mary; I to remember the fun and also hard work we put in at the revellers I remember Cinderella I think you were Prince Charming Jean, we put it on as a Christmas show in about 1954-5. If I recall it correctly we did the first performance for local pensioners free. I was a Royal Huntsman but somewhere on the way to the first night performance I lost my riding crop, I still performed without it in my bright red jacket and black P.E. knickers. One member of the party I recall was named Ron I think he was the comedian of the troop. I also recall we all went to Bulphan Village hall one evening to perform there I was a ballerina in that show. I can still see the dusty little stage and the audience through the cigarette smoke my mother made my ballet dress for me, Charsley’s supplied our tap and ballet shoes. I went to school with Phillip Charsley I wonder if he kept his fathers shoe business going. Jean, are you on the photo on http://www.roselake.co.uk? I have more photos which I will be putting on this sight soon. Mary, Yes I think I must be on these photos I must be in the centre at the back on the group one and I think its me sitting cross leg in the front on the other. What happy time they were would love to see more. I will see if we can republish the photographs on our site and find more. Remember it all very well, with my parent quickly moving all the furniture out of our front room so the trestles could be put up for the street party in the house, because of the rain. I have a picture off all us kids, I’m holding my young sister Linda in my arms. I was also a member of the Revellers and in Ali Barba. We did the Sabra Dance. I also was a member of the Revellers club, and I remember this variety show also Ali Barba and the forty thieves, a picture on the roselake site. I remember we had a big street party in King Edward Road. I remember it rained all day because my mother had made me a red white and blue paper dress and it fell to pieces so we all ended up in Mr and Mrs Pattle’s house because they had a television and we were able to watch the Coronation. I was a member of the Revellers I’m not a 100% sure but I think the show we put on was about the Commonwealth and my part was a south sea island native girl. I do recall singing “I wouldn’t leave my little wooden hut for you”. I do hope this has bought back some fond memories for some of you as it does for me.